Staff from the Center for Leadership and Service with student finalists of the iChange competition and donor Walter Gonzalez Jr. and judges pose at the final presentation. From L-R: Emani Jerome, assistant director, Center for Leadership and Service; Karley Chynces, student finalist; Daniela Cadena, program manager, StartUP FIU West Kendall and judge for iChange competition; Jessica Laguerre, student finalist; Andrea Saladrigas, iChange winner; Walter Gonzalez Jr., president, GOJA and iChange competition judge; and Gabriel Navarro, principal, MMG Equity Partners and iChange competition judge. Startup fever is in the air and growing in Miami. The 2017 Kauffman Index of Startup Activity named it the top city in the country for new companies, outpacing hotbeds such as Austin, Los Angeles, San Diego and Las Vegas. And FIU, for years, has contributed to preparing South Florida entrepreneurs for success, even formally launching StartUP FIU in June 2016. 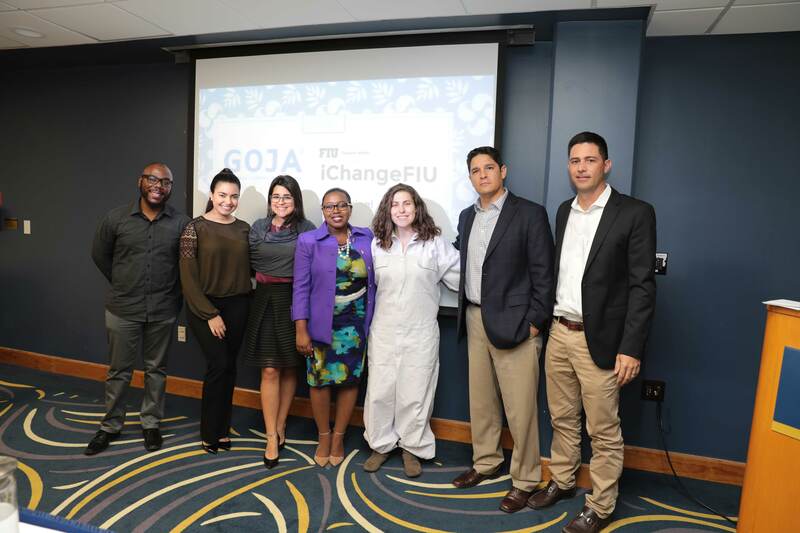 Now comes the latest business incubator ­­at FIU, one exclusively for students with dreams of establishing social enterprises: the GOJA Social Innovation Challenge and iChangeFIU competition within the Center for Leadership and Service. 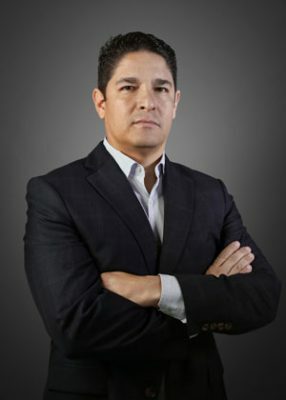 A man of many parts: After earning a BBA in international business and finance from FIU, where he participated in the Honors College, Walter Gonzalez Jr. went on to law school and later distinguished himself for his pro-bono representation and other work on behalf of foster children, earning recognition from the Dade County Bar Association and Lawyers for Children America. In 2017, he received an FIU Torch Award. It was the downside of the startup trend that sparked the interest of successful businessman Walter Gonzalez Jr. ’96. He knew that while startups were becoming more common, the number that don’t make it was also very high. (As many as 90 percent fail, as reported by Forbes in 2015). Eight years ago, Gonzalez was himself embarking on an e-commerce startup, so he knew something of the hurdles. Today, his company GOJA has transformed into a 21st century operation, with a successful brick and mortar location and thriving online business. Beyond just selling products online, the company mines its data and has a dedicated team of engineers building smart software that enhance the customer experience, improves efficiencies and allows GOJA to create its own brands. His staff of 75 in South America and Miami help fill approximately 110,000 orders per month, which makes him one of the top 100 sellers on Amazon.com. With the statistic about startup failure stuck in his head, Gonzalez reached out to Larry Lunsford, vice president for Student Affairs, to see how he might help entrepreneurial students. Lunsford was happy to oblige. He has worked with students for more than 30 years—among them Gonzalez, who was a student leader on campus in his day—and has always touted the importance of giving back to the community. Now, he was witnessing that in action. With that in mind, Lunsford approached Patricia Lopez-Guerrero, director of the Center for Leadership and Service, to develop an idea. 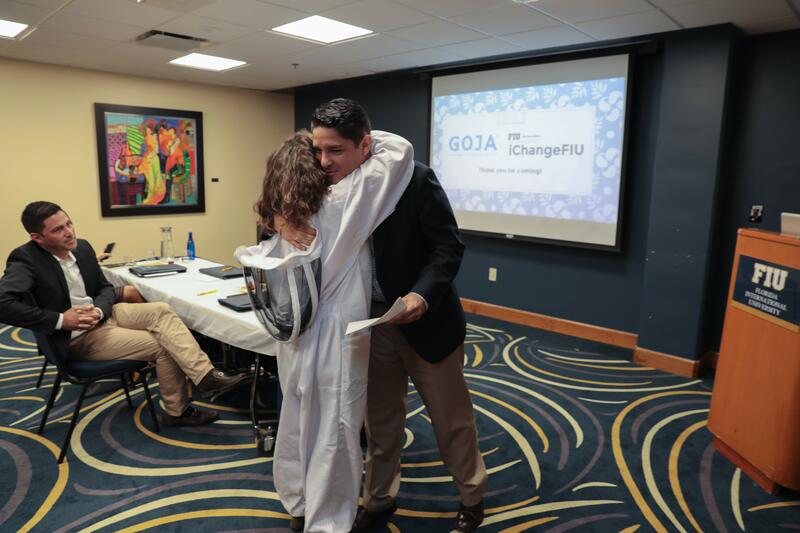 A few months later, the GOJA Social Innovation Challenge and iChangeFIU competition was born with a $50,000 contribution from Gonzalez. It offers a platform for students to present their ideas and vie for the resources. Three finalists receive a $500 mini-grant and mentorship for six months, which will help turn those ideas into viable businesses. From there the finalists go before a final panel of judges who select the winner of a $7,000 grant. The program includes time for the finalists to be mentored by faculty and others in the field. Gonzalez himself also spent several hours a month meeting with them to go over financial projections and share his own experience of how to run a business. It’s that thing that he’s hoping to cultivate in young entrepreneurs at FIU. In March, the inaugural grant was awarded to Andrea Saladrigas ’17 for her idea of training low-income women to become beekeepers. She calls Gonzalez a procedure man, and credits him with giving her guidance to successfully build her social impact company, Master Honey. Walter Gonzalez and Andrea Saladrigas (wearing a beekeeping outfit) embrace as he awards her a $7,000 grant for her startup, Master Honey. In just the past few months since winning the competition, Saladrigas has been able to grow the business and add partnerships. She’s even crossing state lines, looking for beekeepers as far as Michigan, to expand her network. It’s that kind of drive and potential that Gonzalez admires. “FIU is a special place,” he said in recognition of what students can do when given the chance. And he is hopeful that, working together, important things will happen. This year was the first of five years that the GOJA Social Innovation Challenge will take place. Thanks to Gonzalez’s gift, future students will have the ability to learn and grow from the program and mentors like Gonzalez himself.